Bombs tore through two commuter buses in a mainly Christian area of Lebanon on Tuesday, a day before the second anniversary of former Prime Minister Rafik Hariri's assassination. At least three people were killed and 20 wounded in the coordinated attack, the state-run news agency said. A senior politician speculated that the blasts were meant to scare people away from a mass rally to commemorate Hariri, a gathering that has heightened sectarian tensions in Lebanon. There were no plans to cancel the rally, organizers said. Senior government, military and security officials were scheduled to meet later Tuesday to discuss how to keep Wednesday's protest from turning violent. A security official, speaking on condition of anonymity because he was not authorized to talk to media, said the blasts were minutes apart. As people rushed to the scene of the first bombed, a second explosion ripped through a bus that had been following it, the official said. The attack shortly after 9 a.m. on a road in the village of Ein Alaq, just south of the town of Bikfaya in the mainly Christian province of northern Metn, some 30 miles northeast of the Lebanese capital. The Voice Of Lebanon radio station said the targeted buses were taking people to work. Ein Alaq is near Bikfaya, the ancestral home of the Gemayel family, a prominent political Christian family in Lebanon. Pierre Gemayel, a Cabinet member, was assassinated in November. His father, former President Amin Gemayel, visited the White House and met with Bush last week. Gemayel, the president during Lebanon's civil war, told Voice of Lebanon that "alien hands," were behind the explosions. "Lebanese do not kill Lebanese," he said. 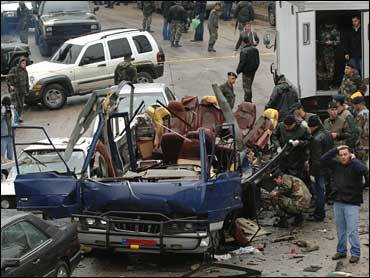 Lebanon's state-run news agency and some police officials originally put the number of dead as high as 12. The lower total of three dead brought agency's count in line with that of the Red Cross. Officials said the confusion over the toll was being caused because the dead and wounded being taken to various hospitals. Security officials estimated the "banana-shaped" bombs weighed at least 4 pounds and as much as 7 pounds. They were packed with metal pellets and placed under seats in the two buses, officials said. The attack came during a thunderstorm. Ambulances, their sirens wailing, sped up the mountain road. Troops in military uniforms and army buses also were at the scene. In the heavy rain, the wrecked buses lay some 30 yards apart, one with its roof blown off. Television footage showed ambulances carrying away people. Blood pooled in several places. Katina Shibli was driving on the road ahead of the first bus when she heard the blast. "We stopped immediately, I rushed to help," she said. "The traffic backed up quickly, when within 10 minutes, the other explosion happened." Genevieve Hayek, in her 70s, the owner of a roadside snack bar 15 yards from the scene said that "barely had help arrived, when the second explosion occurred." "We ran away when the second explosion occurred for fear of more," she said "May God's wrath fall on all of them who did this. What is the fault of the people just going to work?" Troops and police using sniffer dogs quickly sealed off the area and blocked the highway, a usually busy road linking Christian towns in the mountains with the capital. The bombings come a day before supporters of the U.S.-backed government were to mark the anniversary of Hariri's 2005 assassination with a huge rally in Beirut. Walid Jumblatt, a senior pro-government politician , said the explosions were meant to scare people away from the rally. "It's to terrorize people who are willing to come," Jumblatt told Al-Jazeera television. Bombings and shootings have rocked Lebanon since the Hariri assassination, targeting anti-Syrian politicians and journalists. Like Tuesday's attack, most took place in the Christian heartland. "This is an act to undermine Lebanon, so that we might end up like Iraq, with strife and people leaving their country," said Nabil Nekoula, a lawmaker from the district who visited the scene.